Featuring a rampant lion inspired by the one seen on the Royal Banner of Scotland, the Blue Gem Lion Sgian Dubh is a fantastic replica dagger for reenactment, display, or even gifting. The flat pommel displays an inset blue gemstone, an oval shaped jewel that is multi-faceted to showcase its depth. Made of stainless steel, the spear point blade is serrated along its back and near the hilt. This hilt, made of hard black composite, features crossing lines and ridges in alternating directions, creating a stable grip while adding extra detail to the handle. Silver tone bands adorn the top and bottom of the panel, their tone matching that of the central lion emblem. With an included matching sheath, itself decorated with silvery thistle detail, this Scottish dirk is a fantastic display of Highlander inspired design. 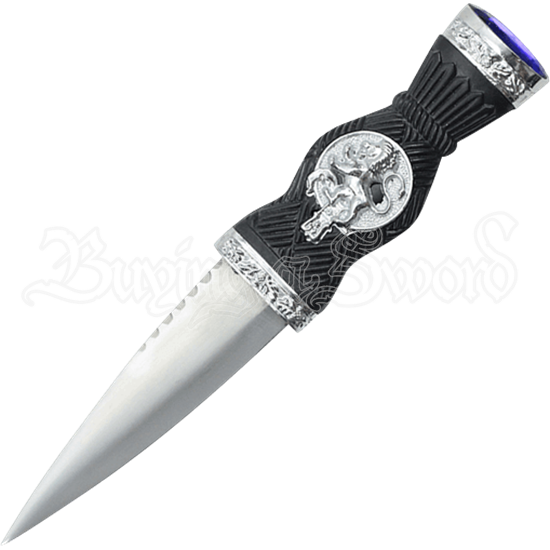 Accent your next historical reenactment look with this stunning gemstone dagger, or gift it to a loved one interested in Scottish history.